The hunters stumble upon the enchanted town that only appears one day every hundred years while they are hunting grouse. The musical Brigadoon's plot revolves around two hunters who stumble upon and enchanted town while hunting. Can You Guess what they were hunting? 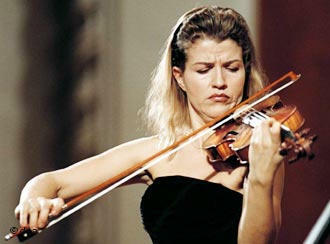 Anne-Sophie Mutter played the premiere performance of Andre Previn's Violin Concerto on March 14, 2002, The composer was the conductor, and she was accompanied by the Boston Symphony. Mutter was born June 29, 1963 in Baden-Württemberg, Germany. 1681 - Birth of German composer George Phillip Telemann in Magdeburg. He turned down the post of cantor at the Leipzig St. Thomas School that eventually was given to J. S. Bach. 1804 - Birth of Austrian composer Johann Strauss Sr. in Vienna. 1824 - Premiere of Franz Schubert's String Quartet in a (sound bite on disc 4), Schuppanzigh Quartet in Vienna. 1847 - Premiere of G. Verdi's opera Macbeth at the Teatro della Pergolain, in Florence. 1885 - Premiere of the Gilbert and Sullivan opera Mikado at the Savoy Theater, London. 1908 - Premiere of Maurice Ravel's Rapsodie Espagnole at a Colonne Concert in Paris. 1932 - Death of photo pioneer George Eastman, founded Eastman School of Music in Rochester, NY. 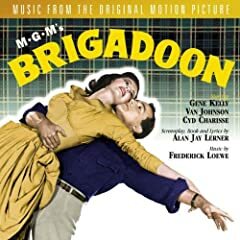 1947 - Lerner and Loewe's musical Brigadoon opened at the Ziegfeld Theater in New York City. 1972 - Birth of US composer and violinist Keeril Makan. 2004 - Luciano Pavarotti gave his final Metropolitan Opera performance in New York City. Since that time Ms. Mutter has performed with many of the world's major orchestras. She has made many recordings. Recoginized as a true virtuoso, in 1983 she became the honorary president of the Mozart Society of Oxford University. Ms. Mutter is interested in many charitable causes including AIDS research. She established the Rudolf Eberle Endowment (part of the Circle of Friends Foundation) which supports talented young string players throughout Europe. Although her parents were not musical, she started piano lessons when she was 5 years old, and shortly thereafter took up violin. By age 7 she was already winning national music contests. She says, "I didn't want to have any other choice then than to play the violin. I was very happy doing that. Actually, probably my childhood is more lucky than other common children because I wanted to play violin at the age of 6, and I actually got the possibility of doing it." At age 13 Mutter appeared with the Berlin Philharmonic as soloist, and at 14 with the English Chamber Orchestra led by Daniel Barenboim. Interestingly, Anne-Sophie Mutter was married to the famous composer Andre Previn. The two often performed together, and made several recordings. I do not often get the opportunity to feature a video clip of an artist. In this case, however, I found a promotional clip of Ms. Mutter and Andre Previn produced by Deutsche Grammophon for their recording of the Tchaikovsky Violin Concerto. It is interesting to listen to Ms. Mutter discuss her fascination with the virtuosity of the piece, then talk about the depth of the piece. Then finally admit, "Up to this day I love to play very fast." And play fast she does! Ms. Mutter's performance on this clip is wonderful, and I love it when I get to hear an artist speak. Click Here to Play the Clip From Deutsche Grammophon. And you can purchase the CD of the recording they are discussing by clicking on the album cover to the left. 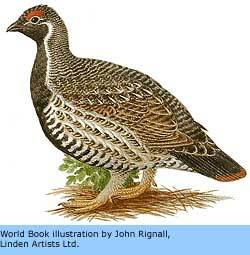 Click Picture for More Info on Grouse.